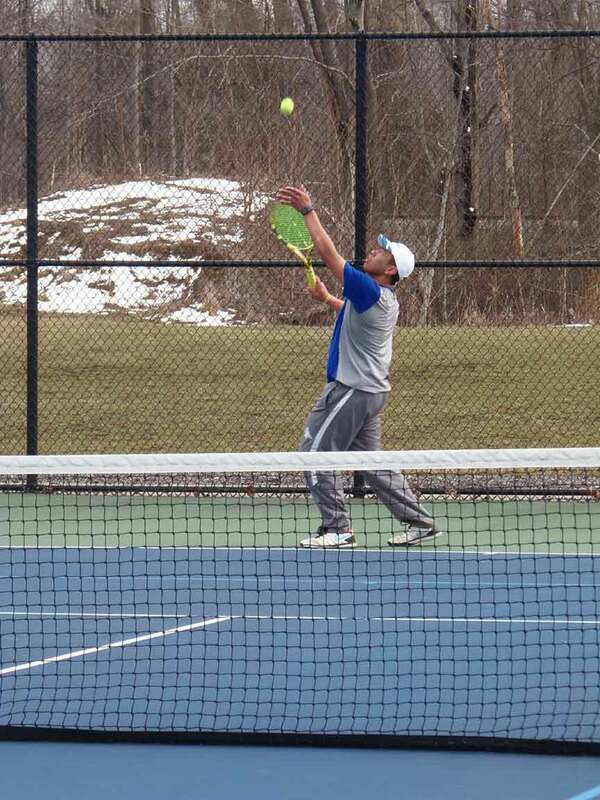 The St. John Heralds tennis team stayed perfect on the young season with a win over the visiting West Geauga Wolverines . The Heralds defeated the Wolverines 3-2 to improve to 5-0 on the season. St. John was able to win first and second singles along with first doubles to take the one match win. Cayleb Haynes, of St. John, won his first singles match against Kevin Wenger, of West Geauga, 6-1, 6-4. In second doubles, David DiSalvatore, of St. John, defeated Jon Rash, of West Geauga, 6-2, 6-0. Michael Elias, of West Geauga, defeated Jack Hammers, of St. John, in a third singles match 6-2, 6-3. Daniel Sheldon and Joey Timonere, both of St. John, made sure the Heralds picked up the win with a first doubles win over Antonio Linek and Roman DiSciscio, of West Geauga, 6-2, 7-5. In second doubles Alex Novitski and Sammy Aidja, of West Geauga, paired up to defeat Dylan Carpenter and Jon Chambers, of St. John, 6-2, 6-4. With the loss West Geauga fell to 1-1 on the season. Pictured: Cayleb Haynes, of St. John, plays in a first singles match against West Geauga.